With a jackpot record of R102,016,595, the South Africa Powerball is one lottery you simply have to try out. The SA Powerball already offers players some tempting winning odds, but you can increase your chances of scooping one of the amazing prizes even more by playing this lottery as part of a syndicate. The numbers for the South Africa Powerball are drawn twice a week in Johannesburg, on Tuesdays and Fridays at 21:00 SAST (19:00 GMT). The draw event is broadcasted live on Channel SABC2. 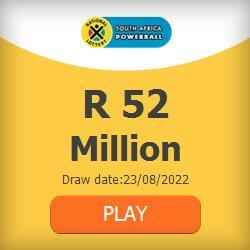 After the draw, you can check your SA Powerball numbers online on megamillions.co.za. Below you will find the results from the last 10 draws in the SA Powerball. All valid South Africa Powerball tickets must include five main numbers chosen from 1 to 50, as well as the Powerball, which is an additional number chosen from 1 to 20. The central aim is to guess all five of the main numbers and the Powerball and collect the jackpot. The South Africa Powerball offers as many as nine prize divisions. Even guessing the Powerball only will earn players the 9th division prize worth R10.00. The SA Powerball jackpot is worth 41.12% of the entire prize pool. The record for the first division prize stands at R145,469,799, which is the equivalent of approximately £6.2 MILLION. The second prize division goes to players who guess the five main numbers, but not the Powerball. This is worth 7.35% of the SA Powerball prize pool. The South Africa Powerball comes with some very attractive winning odds, thus providing players with a solid chance of scooping a prize. In the, which is the best-known lottery in the Powerball series, players have a 1 in 292,201,338 chance of winning the top prize. The South Africa Powerball offers a 1 in 42,375,200 chance of scooping the jackpot, which is significantly more achievable. Copyright © 2019 Play Mega Millions from South Africa. Powered by WordPress. Theme: Spacious by ThemeGrill.